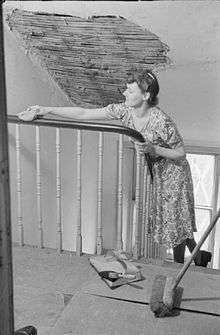 A housewife in 1941 wearing a printed cotton house dress. A house dress is a type of simple dress worn informally in the mornings at home for household chores or for quick errands. The term originated in the late nineteenth century to describe at-home garments designed for maximum practicality and usually made from washable fabrics. It is directly descended from the Mother Hubbard dress. Such dresses were a necessary part of the housewife's wardrobe in the early twentieth century and could be widely purchased through mail-order catalogues.